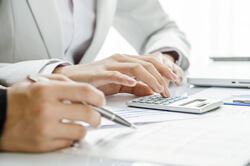 Accurate bookkeeping and accounts are essential to the success of your business. We will discuss your specific requirements and provide a tailor made service so that you have the right level of input for your business. We can have as much or as little involvement as you require, we can simply prepare the year end accounts and tax return or we can have a more hands on approach maintaining your bookkeeping records and preparing management accounts throughout the year. You simply drop off your invoices, bank statements etc and let us do the rest. We can even maintain your records online providing you with access to your accounts info 24/7. Whichever option you choose we will provide a flexible and reliable service ensuring that you have access to up to date, accurate and relevant information at all times. We will explain your accounts to you so that you understand what is going on financially in your business and help you to plan for the future. Tax can be a very complicated area whether you are an individual, sole trader, partnership or limited company. We will calculate your tax liability, complete your tax return and correspond with HMRC on your behalf. Mistakes and/or failure to submit your return on time can be costly. We take the stress out of it for you and ensure everything is dealt with and submitted on a timely basis. Compliance with VAT is increasingly becoming a more complex area. Every business whose turnover has exceeded or will exceed the current vat registration threshold must register for VAT with HMRC. Failure to do so can result in penalties. We will complete your vat return for you, if we do your bookkeeping, or if you do your own bookkeeping simply provide us with your records and we will complete the return for you helping you to avoid penalties. Payroll is complicated and can be one of the biggest headaches business owners have to deal with, especially since the introduction of RTI (Real Time Information). Your payroll information must be submitted on time and you, as the employer, are responsible for all information provided to HMRC. The PAYE and NIC system can be confusing and time consuming for you to research and understand fully. We can provide a full confidential service for all employees including employee payslips (monthly or weekly) and employee summaries. We will deal with all administration and paperwork and with all correspondence with HMRC on your behalf. We can assist you whether you are a contractor or a sub contractor. As a contractor we can verify your subcontractors, produce monthly statements and submit your returns to HMRC. As a subcontractor we can assist you with registering with HMRC and advise how to organise your business records and prepare your end of year self assessment tax return to calculate your tax liability/refund where applicable. If you are thinking of setting up a limited company we would be happy to assist in checking name availability and registering the business with Companies House. Or if you are starting out in business as a sole trader or partnership we can help you get registered with HMRC for self assessment.